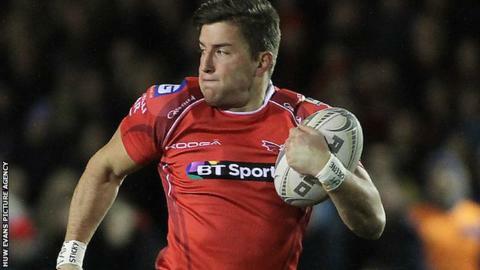 Scarlets wing DTH van der Merwe has been ruled out for the rest of the season because of a shoulder injury. Van der Merwe, 29, suffered the injury during Scarlets' 46-10 defeat in the Pro12 against his former club Glasgow Warriors last Saturday. The South African-born Canada back will see a specialist this week. He has scored eight tries in 19 appearances for Scarlets in all competitions this season. Van der Merwe, who joined Scarlets from Glasgow ahead of the 2015-16 season, became the first player representing a tier-two nation to score a try in four successive Rugby World Cup matches in last year's tournament.